2017 was about large range days and superlative returns in cryptocurrencies. 2018 is about a crushing bear market and a sharp drop in volatility. Bitcoin’s volatility is at year-to-date lows and most altcoins have followed suit. While flat markets are despised by speculative traders, it is a good time to make an investment for the long term. A small range trading period with low volatility will be followed by range expansion and increased volatility. However, we believe that the rise from current levels will face a number of hurdles on the way up. A large number of retail investors stuck at higher prices will bail out when the price of Bitcoin starts a new uptrend. Mike Novogratz, CEO of crypto investment firm Galaxy Digital Capital Management, does not see Bitcoin scaling above $9,000 in 2018. So, has Bitcoin bottomed or can it fall further? Fundstrat managing partner and head of research Tom Lee asked this question to institutions and Twitter users. The results of the poll were interesting. 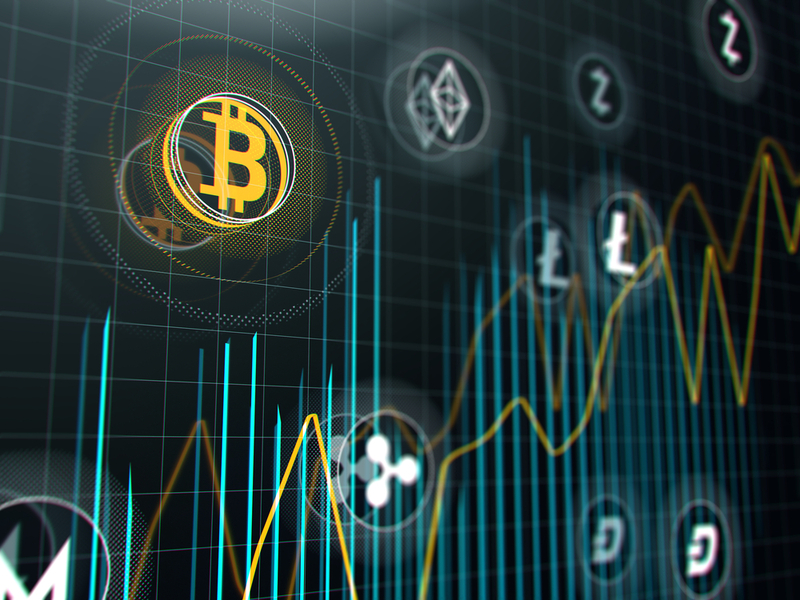 A majority of 25 Wall Street institutions believed that the Bitcoin price had “already bottomed”, whereas the majority of 9,500 Twitter poll respondents think that it is likely to fall further. 57 percent of institutions have a minimum target of $15,000 on Bitcoin by the end of 2019, which is about 127 percent higher than the current price of the leading digital currency. The bears did not take advantage of the breakdown below the trendline and Bitcoin has bounced back above the 20-day EMA. The important level to watch on the upside is the downtrend line of the descending triangle and $6,832. If the bulls scale above these two levels, it will invalidate the bearish pattern, which is a bullish sign. The first level to watch on the upside is the intraday high of Sept. 4 at $7,413.46. If this level is crossed, the BTC/USD pair could rally to the next level of $8,500. The bears might launch a strong defense of this level. On the downside, a break below the $6,341–$6,435 support zone can sink the digital currency to the critical zone of $6,075.04–$5,900. A break of this level will trigger a number of stop losses that can result in a sharp fall. Therefore, traders holding long positions should keep a stop loss of $5,900. Ethereum is at the center of the $200–$250 range. For the past few days, the intraday range has shrunk, suggesting a lack of buying and selling interest. The first sign of bullishness will be a breakout and close (UTC time frame) above $250. Such a move will attract buyers and can carry the ETH/USD pair to the next level of $322.57. On the downside, a break of the $200 level could plunge the virtual currency to the Sept. 12 low of $167.32, below which the downtrend will resume. We do not find any reliable buy setups at the current level; hence, we are not recommending a trade on it. For the past two days, Ripple has been trading between $0.50–$0.55. A breakout from $0.55 could carry it to the overhead resistance of $0.625. A breakout from this level will resume the uptrend. A break below $0.50 will test the support of the 20-day EMA. Any break of this support will retest the bottom of the range at $0.425. A break from this level is likely to result in a fall to $0.37512. As the price is still above the moving averages — which are trending up — we suggest holding long positions on the XRP/USD pair with a stop loss of $0.42. Bitcoin Cash has been holding above the 20-day EMA for the past two days but the bulls have not been able to push prices higher. A breakout from $600 might indicate the start of a new uptrend, while a breakdown from $400 could resume the downtrend. As the BCH/USD pair is holding above the 20-day EMA, we suggest traders hold their long position with the stops at $400. EOS has formed a symmetrical triangle at the bottom. It is largely stuck between $5.30 and $6 since Sept. 26. Attempts to break down from the 50-day SMA have seen buying at lower levels, which is a positive sign. A breakout from the symmetrical triangle has a pattern target of $8. However, we believe the EOS/USD pair will face stiff resistance at $6.80. Traders can hold their long positions with the stop loss at $4.90. A close below the trendline of the triangle could sink prices back to the $4.49 level. Stellar has held the 20-day EMA for the past two days but has not been able to close (UTC time frame) above $0.24987525. A breakdown from the 20-day EMA can result in a dip to the 50-day SMA and below that to the critical support of $0.21489857. The XLM/USD pair will turn bullish if it breaks out and closes (UTC time frame) above the downtrend line of the descending triangle. As the bulls have managed to defend the 20-day EMA, we suggest traders hold their long positions with stops at $0.21. Litecoin is currently trading close to the center of the $49.466–$69.279 range. The moving averages have been flat for the past nine days and the RSI is close to the midpoint. The LTC/USD pair will turn positive on a breakout and close above $70, and will turn negative on a breakdown and close below $49. Trading inside a range can be volatile and can hit stops on both sides. Short-term traders can buy a small quantity on a rebound from the bottom of the range, whereas positional traders should wait for a breakout above $70 to buy. Cardano broke below the 20-day EMA on Oct. 2, but the bears have not been able to push prices to the lower support at $0.071355. The flat moving averages and the RSI close to the 50 level shows equilibrium between the bulls and the bears. If the ADA/USD pair breaks out of $0.94256, it will indicate that bulls have the advantage, whereas a drop below $0.071355 will suggest that the bears have an upper hand. Between these two levels, the digital currency might consolidate for a few days. We will wait for a buy setup to form before proposing any trade on it. Monero has been trading close to the $115 level since Sept. 29. This shows a balance between both buyers and sellers. Both moving averages are flat and the RSI is close to the 50 level, which suggests that lackluster trading action might continue for a few more days. The XMR/USD pair could move up to $140 if it sustains above $121. On the downside, a break below $107.80 could result in a drop to $103 and $96. Traders can maintain their long positions with a stop loss of $100. IOTA has extended its stay inside the $0.6170–$0.5000 range. Both moving averages are flat and the RSI is close to the midpoint, suggesting continuation of range bound action. The IOTA/USD pair might attract buyers if it breaks out and sustains above the range. The first target of such a breakout is $0.8152. If the bears break below the range, the digital currency can retest the low at $0.4037. Traders should wait for the price to close (UTC time frame) above $6.50 before initiating any long positions. Next articleOp Ed: Why Is There So Much Talk About a Bitcoin ETF?